The Spectrum towers development is the largest development built by Concord Pacific in the last 10 years. It is a monument to modern design and efficient living. The location is fantastic as it sits on top of Costco and is moments from the sky train station. LOCATION: Spectrum at Yaletown's Edge is the newest Concord Pacific development located at the gateway to Downtown Vancouver between BC Place Stadium and GM Place on top of Costco. Walk half a block to Stadium Station and TNT Supermarket, two blocks from QE Theatre and the Seawall, and only three blocks away from Library Square & Robson Street. Live work and play has never been more convenient. FEATURES: The Spectrum is the latest addition to Concord Pacific Place. 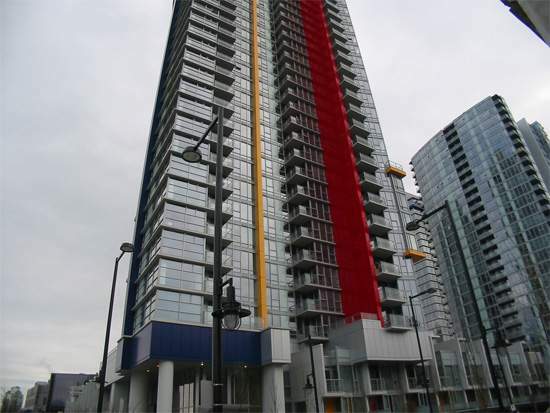 This 1 bedroom + office + balcony unit faces south east directly overlooks GM Place to the left, BC Place to the right and a gorgeous partial water view of False Creek down the middle. The open living area features laminate floorings throughout. The sleek urban L-shaped kitchen comes with two rows of all white cabinets, built-in wine rack, Faber hiddle hoodfan and ceramic glass cooktop. Living room comes with wall indent for entertainment systems and an open balcony. The bedroom comes with sensible dark carpeting. 4 pcs bathroom comes with stainless steel circular basin with sleek single lever chrome faucets. Unit also comes with an office, insuite laundry and one underground parking stall.